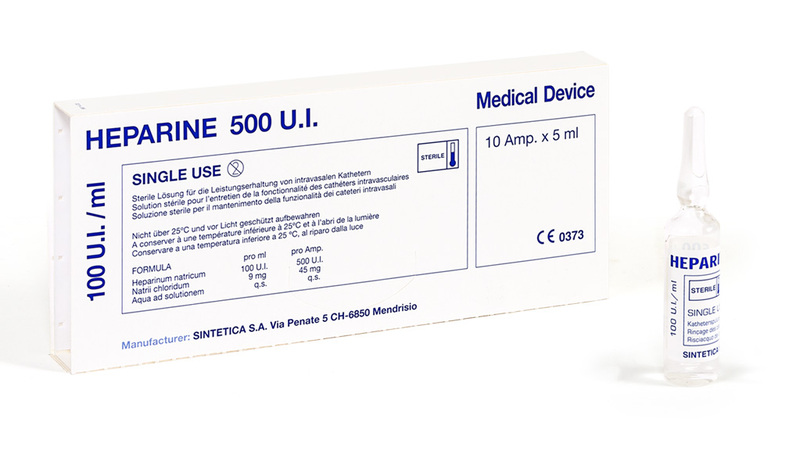 Heparin 500 U.I. is a CE-certified class III sterile product, complying with the directive 93/42/CEE. Class III includes sterile solutions that come into contact with blood circulation. Heparin 500 U.I. is an isotonic solution of Heparin sodium at physiological pH indicated for maintaining the functionality of peripheral venous, central venous and implanted intra-vascular catheters (port system). Heparin 500 U.I. prevents the formation of blood clots and/or the accumulation of drug residues and thus ensures catheter efficiency.